A man has been sentenced to two-and-a-half years in jail for the dangerous operation of a jet ski causing the death of his nine-year-old son. Shane Michael Parkes, now 36, pleaded guilty in the District Court in Mount Isa to causing the death of his son Tobi Michael Parkes at Lake Moondarra in 2016. Parkes and his sons were on a family camping trip at the popular lake near Mount Isa in north-west Queensland. Crown Prosecutor Amanda Payne said Parkes was riding a jet ski with his six-year-old son at the time, before he struck his older son, causing him to drown. “The defendant was doing donuts and figure eights in the water about 8 metres from the bank and at one point he rode close to the bank spraying water on the children that were standing there,” she said. “Witnesses heard the [jet ski] engine running either flat out or at high revolutions. “At the time Tobi was in the water near the campsite either swimming or standing in stomach-deep water. “The defendant saw Tobi as he approached the campsite but was unable to turn the vehicle [jet ski] due to a mechanical fault. “He yelled to Tobi to get out of the way. “The jet ski struck Tobi and then crashed into the rocky bank near the campsite. The defendant and [the six-year-old child] were thrown off the jet ski into the shallows. “[The six-year-old] had blood coming from his head and nose, he had a fracture and severe deep cuts on his legs. Defence Barrister Simone Bain said witnesses saw her client in a state of distress, crying, calling out for his son Tobi and searching for him in the waters. Police and State Emergency Service teams searched for the child after he failed to resurface from the water, using a helicopter, ground crews and swift water rescue crews. Police divers found the body of Tobi Parkes in Lake Moondarra about 6am the day after the incident. 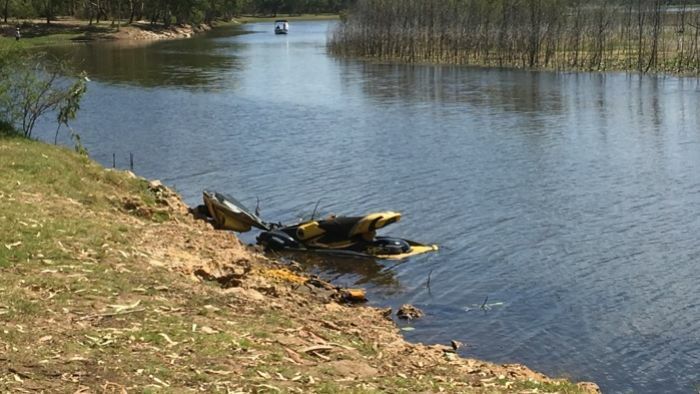 Crown Prosecutor Payne said the jet ski could not be steered away due to a mechanical fault and Parkes was not licensed to drive a jet ski, which he was operating at fast speed. “The defendant’s ability to operate a jet ski safely was impaired by the location of his young son, a passenger in front of him, and the jet ski was in an unsatisfactory condition — it wasn’t seaworthy,” she said. “The steering was tight and notchy and could not move through its full range of motion. Ms Payne said Parkes’ offending was further aggravated by the fact he caused the death of his son while on bail for drug trafficking offences and had a relevant traffic history. This included unlicensed driving, careless driving and driving a car while cannabis was present and a number of speeding offences. “His traffic history shows a long period of disobeying traffic rules and driving in essentially in a dangerous manner,” she said. The court heard Parkes was a chronic cannabis user who had smoked cannabis the night before the incident and had a high reading of THC — tetrahydrocannabinol, the main ingredient in marijuana. But there was not enough evidence to support the effect of cannabis on someone’s ability to operate a jet ski so it was ruled out as an aggravating element to the charges. Defence Barrister Simone Bain said her client had not touched cannabis after realising he would be facing criminal charges over his son’s death. She argued Parkes’ criminal culpability with regards to the mechanical defect of the jet ski was limited because the damage to the steering cable was hidden inside the vessel. “It is clear upon the evidence in my submission that this was a tragic failing of the steering mechanism,” she said. Parkes told court the day in question was the worst day of his life and he could not take it back. “It’s a sentence I have to live with for the rest of my life,” he said. In sentencing, Judge Ian Dearden said the presence of cannabis may have affected Parkes’ judgement among other factors. “There’s no doubt your judgement at the time this incident occurred was clearly very poor,” Judge Dearden said. He said the tragedy was avoidable. “The loss of any child is a matter of profound grief. “The loss of a child for which you are directly personally responsible is a matter of not only profound grief to you but to your family. Parkes, who is already serving jail time for drug trafficking offences, will now be eligible for parole in November 2020.